I was disappointed with the cost of colour printing so I did a search to try to find the printer/system with the cheapest running cost; I fully expected it to be a colour laser of some sort. To my surprise, it wasn't! I discovered Continuous Ink Supply Systems for the first time, which if they work, are the cheapest by far. I wanted a printer with automatic duplexer to further save costs on paper, and if price wasn't prohibitive I would also like the ability to print on A3. After checking half a dozen of my favourite sites, I found the Brother MFC-J5910DW (A3/A4, auto duplexer, scanner, copier, fax) from Amazon for just £115 (Mar 2012). A search for a suitable CISS took me to cityinkexpress.co.uk. Here I could purchase a compatible CISS for the Brother in question for £48. I could purchase normal high capacity cartridges that are good for 1200 pages for £16.80 per colour from printware.co.uk. Now I couldn't find out what the volume of these cartridges was, but I did find out that they weigh 79g. 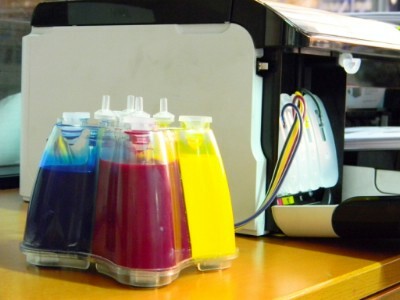 Allowing, say 20g for the plastics, that would leave a maximum of 59g of ink, and assuming that it's the same density as water, that would mean that a high capacity cartridge contains about 59ml of ink. So, four high capacity colours at £16.80 each = £67.20 and would give me around 236ml of ink. That's 28.5 pence per ml. 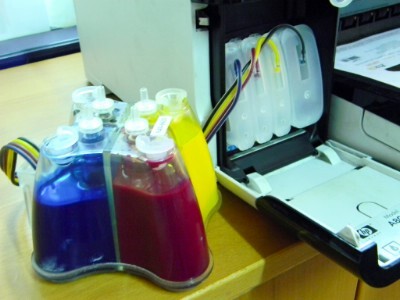 The CISS kit, including postage cost £54.38 and gives 400ml of ink. So that's 13.6 pence/ml. It gets better than that though because the refill inks from cityinkexpress.co.uk are £22.80 for a set of 4 x 100ml. Giving just 5.7p per ml or one fifth the price of high capacity cartridges for the same amount of ink! OK, so the sums add up for the CISS, but do they work reliably? I did a trawl of various websites and forums and concluded that on the whole, there are more CISS systems our there with happy users than ones without. I also spoke to a friend of mine who is both a computer nerd and a semi-professional photographer. He assured me that high end, large format photo printers are basically scaled up ink jet printers with integral CISS! I decide to go ahead. 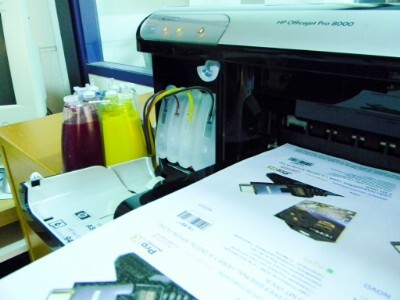 Both printer and CISS where ordered mid morning on Friday. The printer arrived Saturday and was setup without problem. The CISS arrived on Monday. On opening the CISS box, I was a little disappointed to find that there were no printed instructions at all. On checking the cityinkexpress website, I quickly found a link to a video guide. The video is 6 minutes 12 and seemed to explain everything. There was a difference between the system shown on the video, and the one supplied to me; On the video there is a roller to move which I gather acts as a kind of ink supply cut off – you must obviously turn it on before installation. My system had no such roller and there seemed to be no equivalent device, so this part of the installation was skipped. Next, I had to remove some ink from each of the air chambers and drop it back into the main reservoirs. I was a little concerned because only one syringe was supplied and I was worried about the possibility of mixing the colours by using the same syringe for each ink. In reality, there was no need for concern. I simply flushed the syringe out in between each colour ink by sucking up hot water and squirting it out. I only had to repeat this about 4 or 5 times before clean water was seen going in and coming out. The mischievous might like to know that you can squirt water quite a long way across the kitchen with the syringe! I had to have two goes at inserting the CISS cartridges into the printer because they did not readily click into place as the “real” cartridges do. I found that they needed pushing at the top of the cartridge rather than in the middle as I had first tried. The cartridge door can be gently forced shut with the tubes coming out of the finger shaped indentation that is provided to open the door. On my larger A3 printer, the supply tubes are not long enough for the reservoir to be placed on the left hand side of the printer; this is a minor problem for me as the right hand side of the printer is also the edge of the shelf that the printer is on, so it opens up the possibility of knocking the reservoir off the shelf! Installation was completed in about 10 minutes (not including syringe mischief time) and without any real problems. 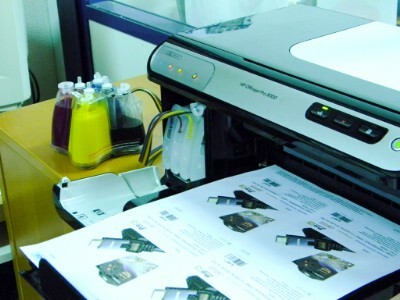 • The sums add up; I haven't been able to find a cheaper alternative for colour printing. 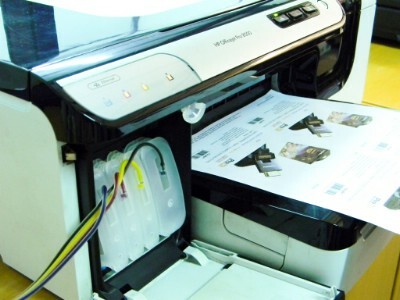 • It's basically the same technology as larger higher quality photo printers. • It's easy to install; watch the video before you buy – it really is that easy and straight foward. • The colours are better than the original Brother cartridges. • The length of the tubes dictate that the reservoir must sit on the right hand side of my large printer. p.s. I am NOT affiliated with cityinkexpress - I am a genuinely happy customer, although if I was reading this, I wouldn't believe this statement either, so you must make your own mind up whether to buy! I am an amateur photographer who is very serious about his work, taking mainly wildlife shots. I produce my own A4 and A3 Prints, along with Christmas cards and calendars. Some I sell and others are passed on to friends and family. What I’m leading up to is that I must have quality and get that quality as cheaply as possible (I am also retired). Don’t we all want those two anyway? I have been using City Ink Express for quite some time now, and they fit those criteria. The inks have not faded one iota over at least two years, the colours are accurate and I don't have any waste because I am using a City Ink Express CISS system. I have used one on my Canon PIXMA iP4700 A4 printer for over two years now with absolutely no problems. I have now gone up a notch to A3 format with a new Canon PIXMA iX6550. I have purchased another City Ink Express CISS which is also problem free and saves me even more money. I really cannot over emphasise how excellent City Ink’s service and product quality are and how much can be saved if only by using their inks. Much larger savings can be made by buying a CISS from them. Here are three savings. 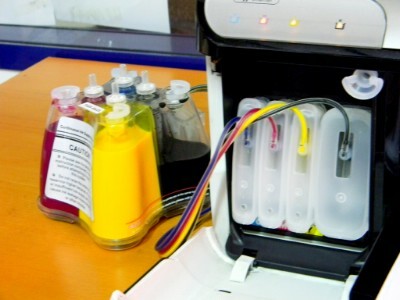 1) Its inevitable when you change, handle or refill cartridges that you waste or lose some ink. By however small an amount - it all adds up over time. 2) It takes time to remove, refill and replace cartridges, then you still have to wash and tidy up which takes more time. 3) There is less wear and tear on your head (?) 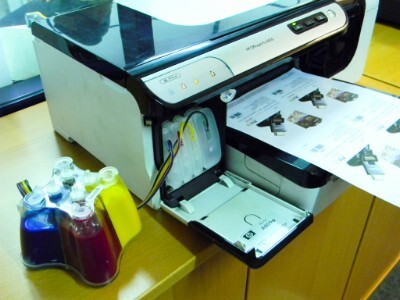 and other printer parts by not having to continually remove and replace cartridges. You probably will not wear gloves and no matter how careful you are you will land up with some colourful fingers that last a day or three. Of course there is always the chance of a spillage, with yet more mess. 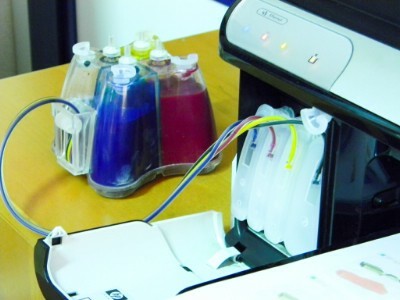 With a City Ink Express CISS all you need to do is pull out a stopper from whichever ink tank is low and top it up from your ink stock bottles. It’s that simple, easy, clean, quick and waste free. It’s like pouring milk into a cup of tea but is much quicker than making one, even if you should need to refill all five tanks it’s still quicker. Set the system up, don’t tamper with it, use the printer as normal and it’ll save you TIME, MESS, MONEY and Grey, Cyan, Magenta, Yellow hair. On the down side you’ll lose the rainbow effect on your fingers.